Don't you just love beach pottery? Pieces of china end up in the sea, and are tumbled by the waves for months or even years, making the edges soft and the pieces unique. A beautiful mixture of men made material with touches of nature. I love to use them in jewelry and when someone asked if we could make a cuff like this sold one again, I started right away, puzzling with the pottery pieces and vintage materials. The combination of all these pieces with history makes each piece one of a kind. At this cuff I added blue coral pieces (shaved to fit in the cabochon spaces) for an additional beach vibe in blue shades. This cuff has a lot of beautiful details and only had a few glass cabochons left, all were removed and replaced with irregular pearls and a natural shaped beach pottery in the center. 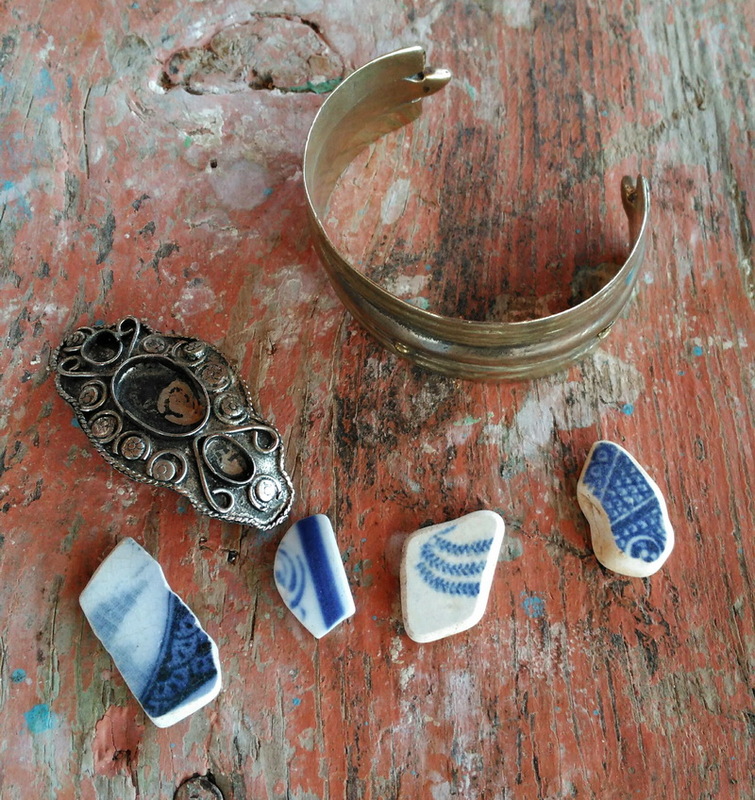 These cuffs are at least 70 years old and made completely by hand with very primitive tools, yet with gorgeous results. They are nowadays hard to find luckily we bought a bunch years ago. Planning to make necklaces in this style too! What a precious sea treasure! The wonders of the sea. I love how you put them together! They look beautiful! I love how you turn in unique jewelry sea treasures! I truly love these beach pieces and I am sad I have no beach nearby. I think they're so inspiring. You made such a gorgeous piece with them!! So beautiful and unique bracelets! Great work! Such beauties :) I never found any myself at the beach, but would love to! Love sea pottery and the work you've done with them! Such lovely pieces! The pottery pieces look like they were especially made to fit in the bracelets! I love China washed by the sea! Unfortunately I never found such amazing treasures! In our part of the Blue Sea I only find seaweed ashore and maybe some plastic bottles :( which is very sad!